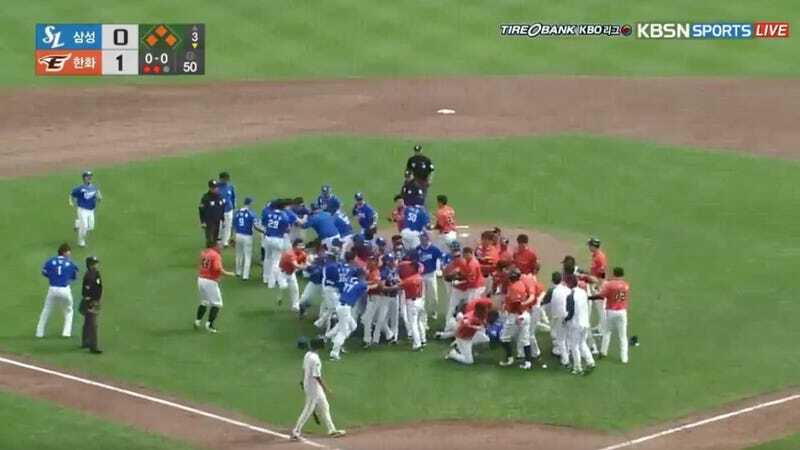 The KBO League’s Samsung Lions and Hanwha Eagles left their benches twice and fought in Sunday’s game. A total of six players and coaches have been punished for their roles. On a 2-2 count with two outs in the third inning, Lions pitcher Yoon Sung-hwan nicked the Eagles’ Kim Tae-kyun. The two stared each other down and the benches cleared, but nothing further happened. After everyone settled down, Yoon used his very next pitch to plunk Wilin Rosario. The former Rockies catcher was furious, the benches cleared again, and players threw punches. The KBO announced punishments today for both teams. Yoon received a six-game suspension; Lions pitcher Zach Petrick was fined 2 million South Korean won; and Samsung coaches Kang Bong-gyu and Kim Jae-geul each received a five-game suspension and were fined 3 million won. Eagles pitcher Carlos Villanueva—who tore a ligament in his pinkie in the fight—was suspended six games; Hanwha’s Chung Hyun-suk received a five-game suspension. Each club was also fined 5 million won.